What is the true role of education in a person’s life? Besides imparting knowledge and skills, it also acts as a conduit to infuse good values in a person to become a good human being with a strong character and take decisions for the benefit of society and humanity. 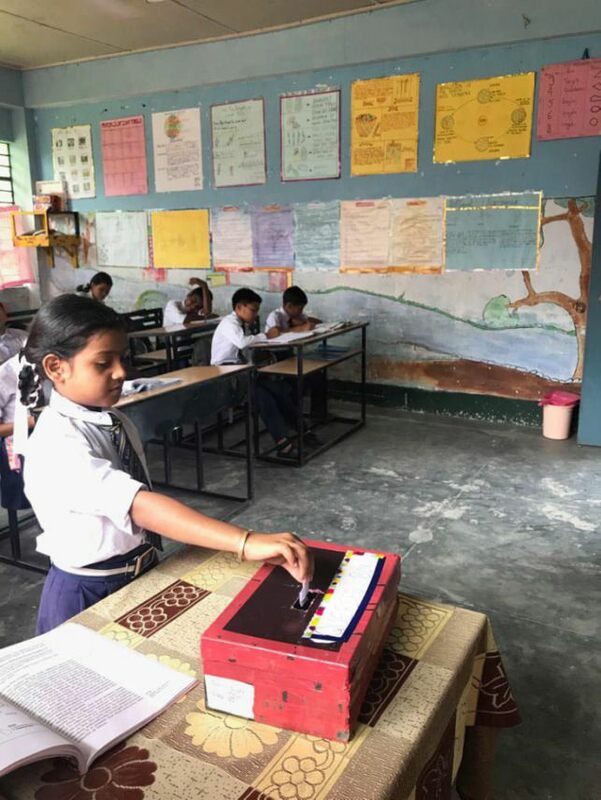 Sri Aurobindo Society’s Zero Investment Innovations for Education Initiatives (ZIIEI) not only focuses on the academic growth of children but it also emphasises on their holistic development so that they grow up to be good thinkers and leaders. ZIIEI innovation ‘Human Values’ involves various classroom activities teachers can undertake that hones the students’ inherent qualities, including responsibility, confidence, co-operation, respect and empathy. Each activity featured as part of this innovation is focused on specific human values. The positive change in students and learning environment through all these activities can be ensured by carrying these out on a regular basis throughout the year, rather than as a one-time activity. Hence, the teacher plays an important role in enabling students to participate meaningfully. Inspired by National Cadet Corps (NCC), this innovative activity encourages students to be always ready to help others and recognises their efforts by awarding them different badges/ribbons. The main idea is that students get opportunities to hone their sense of responsibility and empathy, and they willingly start identifying ways to develop leadership and life skills through self-development, challenge, adventure and fun! Scouts & Guides is all about young children’s all-round development. Their general knowledge improves, and they learn important skills required for better learning in classroom and in life, including sense of Duty, Commitment, Discipline, Leadership and Teamwork. Their confidence and self-esteem also improves significantly. This activity is most suitable for upper primary class, and can also be integrated with syllabus topics. Teachers spend 10-15 minutes talking to students about the importance of helping others. In this discussion, the difference between sympathy and empathy can also be mentioned. Sympathy means you merely pity someone’s misfortune. Whereas empathy means that you understand the feelings of another and take some action to comfort this person. Then, discuss with students how they can lend a helping hand to their classmates, family members, neighbours, pets and stray animals. For this, they do not have to take any risky work. Sometimes simple and intuitive tasks can be a big support to others. Please follow these steps to start Scouts & Guides in your classroom. 1. Introduce Scouts & Guides to your class as a game of collecting badges/ribbons of all the colours within one academic year, by helping others in their school, home or community. Provide examples, like helping parents with household work (cleaning, feeding animals, feeding siblings etc.). The second example is teaching classmates, younger siblings or neighbourhood students. Another one is of helping the elderly persons cross the road, or fetch water, or visit the market. 2. Scouts & Guides can also be integrated with subject topics taught in the classroom. For example, if students have read about mosquito-borne diseases or about cleanliness, then the teacher can ask them to help their neighbours ensure there is no stagnant water in their homes, bathrooms drainage is not blocked, kitchen is clean, etc. 3. Students must write a description of the helping work done in their Scouts & Guides notebook. 5. At the end of the academic year, students who have managed to collect badges/ribbons of all the colours are applauded and recognised in the class. 6. At year-end/annual day celebrations, the teacher may also invite various persons helped by the students, so they can share their experience and further encourage children to continue the good work. Children have an innate sense of right and wrong. However, growing up they face multiple stimuli and influences — family, friends, school, society, television, social media — that sometimes guide them well, but also sometimes leave them confused as to what is values-based and what is not. The bigger problem is that often when children need clarity of thinking, they are hesitant of asking questions or expressing themselves to others. ‘My Postbox, My Voice’ is an interesting way to encourage them to find answers by posting letters to the teachers or friends they want to reach out to. These letters can be to ask questions to the teacher about deeper meanings of things children observe, about a complicated situation in a story they have read in the class, or these letters can be to say ‘thank you’ or ‘sorry’ to classmates. This activity improves teacher-student trust and bonding, and also creates a cordial, supportive learning environment as classmates get to understand each other’s goodness. Values of gratitude and humility can be especially encouraged through this activity, along with curiosity and urge to understand things better. The teacher will need to create and hang a postbox in the classroom. You may decorate an empty cardboard box with colourful paper and write 'My Postbox, My Voice' on it. Students may also participate in decoration work. What to do — Students are asked to always keep in mind that our human values are our greatest asset. Whenever they experience, see, hear, read something that is related to values, they should ponder on its meaning and decide what actions they should take. If they do not understand, they can ask questions by writing a letter. When to do — Each student writes at least one letter every week. The teacher opens the post box every day at a fixed time. What next — The teacher goes through the letters and on-the-spot selects which letters should be discussed in the class, and which students need to be counselled individually. Regular practice maintains a lot of enthusiasm among children for writing letters and they get to strengthen their character on a daily basis through this communication channel.